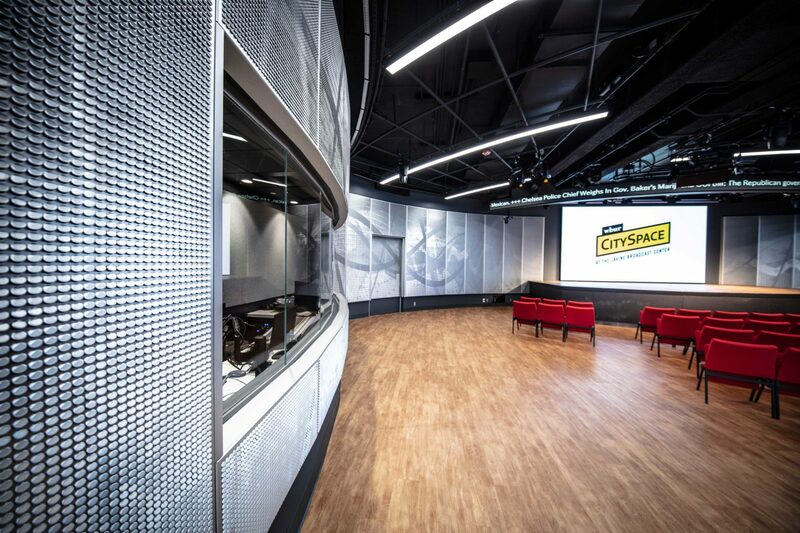 CitySpace is located on Boston University's campus at 890 Commonwealth Avenue. If you're using Google Maps, CitySpace is located right on the Boston/Brookline line. Although 890 Comm. Ave. is located on the Boston side, you may need to enter "890 Comm. Ave. Brookline," in order to keep Google from getting confused. As long as it takes you to the block between St. Paul and Amory Streets, you're headed in the right direction. Boston University is easily accessible by public transportation. The B branch of the MBTA Green Line passes through the campus along Comm. Ave. Once on the Green Line, CitySpace is located at 890 Comm. Ave. at the corner of St. Paul St. The T stop is St. Paul. Take the Red Line train to Park Street station and transfer to the Green B Line train. Take the B line to the St. Paul stop. Take the Blue Line train to the Government Center station and transfer to the Green B Line train. Take the B line to the St. Paul stop. Take the Orange Line train to the Downtown Crossing station. Follow the underground concourse to the Green B Line train. Take the B line to St. Paul. From Lechmere, Science Park, North Station or Haymarket, take any train to Government Center station and transfer to the Green B Line train. From the suburban C or D lines take any train inbound to Kenmore Square station, change to the outbound platform and board the B train. From the E line, take any train inbound to Copley Square station, change to the outbound platform and board the B train. Take Storrow Drive to the Brookline/Boston University exit, which is marked only with a small sign. From the exit ramp, turn right onto Comm. Ave. and immediately move to the middle lane to avoid going over the BU bridge. CitySpace is located on the opposite (eastbound) side of Comm. Ave., at the corner of St. Paul St.
Or: Take Comm. Ave. eastbound. Or: Take the Mass Pike to Allston/Brighton; stay left at the tolls and follow the ramp onto Cambridge Street. Turn left on Harvard Street, then left again on Brighton Avenue. At Packard's Corner, Brighton Ave. merges into Comm. Ave.
Take Comm. Ave. to St. Paul St. Or take Storrow Drive to Kenmore Square, then turn right onto Comm. Ave. Or take the Mass Pike to Allston/Brighton; stay left at the tolls and follow the ramp onto Cambridge St. Turn left on Harvard St., then left again on Brighton Ave. At Packard's Corner, Brighton Ave. merges into Comm. Ave. Continue straight on Comm. Ave.
Take 1-93 to either Storrow Drive or the Mass Pike and then follow directions from the east. Street parking is limited, but metered spots are available on Commonwealth Ave., St. Paul Street and various streets in the surrounding area. Guests should self-identify as attending a CitySpace event to receive a discounted event rate (currently $12 and subject to change). Parking may not be guaranteed for every event. Please contact Boston University Parking & Transportation Services for the most up-to-date parking information. Please be sure to reference the CitySpace event and date you will be attending.